Whether you're in a relationship or single, Valentines Day is very much a love-hate (see what I did there?) occasion. Some people feel it's just become commercialised, others live for it. I probably fall somewhere in the middle. I wouldn't cry if the date wasn't marked because in the grand scheme of things it doesn't matter much, but if you're gonna take me for a scrummy dinner and buy me flowers, that's also totally fine by me! Increasingly I think most people are looking to spend a little less on Valentines Day and make it more about quality time (not that you shouldn't do this every day anyway). Maybe you could cook together instead of going out - restaurants always enforce pricey set menus for the evening anyway. You could go for a long walk and explore somewhere new, see a film or a play - just share an experience. What you do (or don't do) is up to you! One thing though that I really think you should skimp on for Valentines Day is chocolate. It's pretty much the key to my heart - no really, I think I might be made of chocolate! It's a relatively inexpensive gift to give and it's always going to be appreciated! That's why this Valentines Day I'm teaming up with Thorntons to give away one of their HUGE continental selections. Whether you'll be spending the day with a significant other or simply looking after number one, it's sure to go down a treat. And take you a good few days to polish off. You can enter the giveaway below, and the winner will be drawn and contacted after it closes on 15th February. 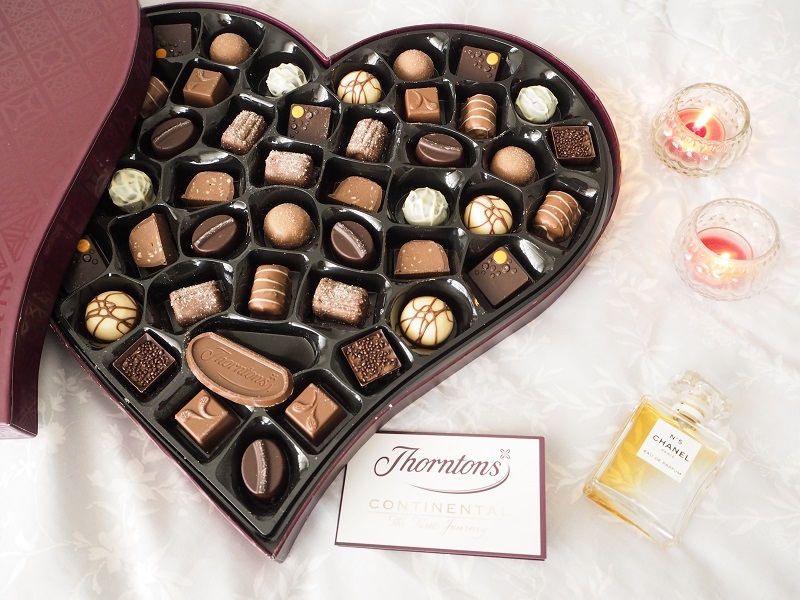 If you're stuck for ideas on how to spend your Valentines Day this year, Thorntons have also put together this handy list of recipes, gift ideas, activities and more! Yes! It's so good to just chill sometimes rather than being on the go and dining out etc - I find it too stressful even to book a table! I'm just like you, I'm totally in the middle, I'm happy either way! And well, who doesn't like to be spoilt? I reaaaally don't need to be eating any more chocolate as it is, but thorntons are my favourite and well! Look how scrummy they look!